With just a few days left until the world-famous Goodwood Revival, Vauxhall will be supporting the event once more with a mixture of heritage and style that captures the spirit and theme of the venue. Taking pride of place in the Goodwood Revival Transport Corps is Vauxhall Heritage Centre’s prized 1926 OE-type 30-98, which will be busy bringing racing drivers into the circuit throughout the three-day event. Whilst the 30-98 was built some years before Goodwood circuit opened in 1948, such was its racing pedigree that it would have been a common site among the racing fraternity of the day. The Vauxhall Heritage car, complete with Velox body, is one of the most original examples in existence. Known by its chassis number, ‘OE268’, it’s set to provide Goodwood’s racers with a ride to remember – even before they reach the circuit. Earls Court Motor Show is another highlight of Goodwood Revival, and this year every visitor will get the chance to see their name in lights – and get a photo to prove it – at the Vauxhall Cinema stand. Celebrating the premiere of ‘Goldviva’, starring Sean Connelly, Earls Court show-goers will see a Viva HA like no other, along with the all-new 2015 VIVA. 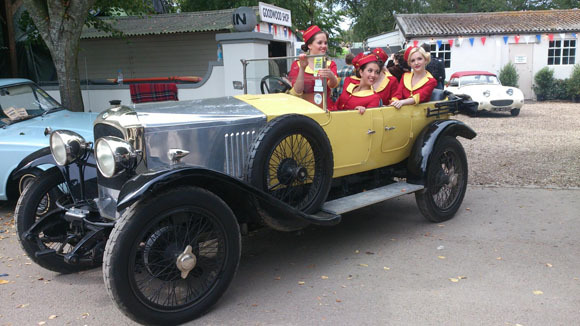 Goodwood Revival runs between Friday, September 11 and Sunday, September 13.